Do these faces tell a lot? accompanying the article by Titus Arnu. A NEW BREAD & PUPPET THEATER? During the 1960s, many artists in the U.S. and Europe joined the protest movement in the so-called Third World and used their art in order to oppose the war in Vietnam. War crimes like the massacre of more than 500 innocent women, children, and old men in My Lai, a South Vietnamese village razed by US marines, had stirred the conscience of many who had previously remained silent, considering politics a 'dirty business' or simply too far away from the world of art. Of course, it revealed a sense of commitment. A necessity to take action, to become involved. Since the last decade of the 20th Century, artists all over the world are again waking up and leaving the ivory tower. Forms of street theater, happenings, fantastic and surreal actions do again surface, in new and specific ways, and they are again a means of making political statements. Art is becoming political again. In a new way, it is becoming meaningful again, as a form of artistic intervention. This is not to say that non-political art cannot be beautiful and meaningful. But it shows that for many artists, in situations they face today, to make beautiful works of art, to make beautiful films, to stage plays in a way that is aesthetically intriguing, is simply not enough. As in the 1960s, the artificial line that was invented to separate the 'professional,' that is to say, art-market oriented artists from 'self-styled' artists (or so-called amateurs) is being scrapped. (1) We all know that this line was always dear to bureaucrats, people from the IRS, and certain critics who have no idea what artistic involvement is about. The surrealists knew that in order to be a poet, you do not necessarily have to jot down lines of 'poetry.' Every sentence you speak can be poetry. Every single act of yours can be a poetic, surrealist act. For the surrealists, the quests for poetry, the miraculous and social change seemed inseparable. This stance has influenced the situationists later on. It influenced those who invented 'happenings.' Alan Kaprow, for instance. In Berkeley, in the mid 1960s, students appropriated happenings as a form of political action. They became political artists. They re-invented art. You have only to look at the photos of the young people who occupied Alcatraz at the time. The Young Lords. They re-invented art. Of course, another strand of political street theater and political happening was in the tradition of Brecht, rather than the surrealists. A great impulse! Which still reverberates around the world. We see the effects of this everywhere - from France, where groups of so-called 'sans papiers' have created their own forms of street theater to formulate their quest for justice, to the Philippines where forms of street theater and street happenings play a part in the popular effort to oust a corrupt and malicious president, in another people's revolution, comparable to the one that ousted the murderous Marcos. people passing by, strangers new in the city and people from the neighborhood were taken in by the convincing gestures, grimaces, acts of derision, ridicule, and subversive immitation of "Prussian" authority, and joined the game of fun-loving art and spontaneous civil disobedience, an entirely humorous and funnily anarchist play with art and words and body movements that, for a few hours, took possession of a part of the city of Cologne, giving it back to the people of the neighborhood, the people who live there. A highly symbolic act which again shows that all good and noteworthy art, especially political art, is largely symbolic, expressing needs, desires, hopes that remain as yet unfulfilled and that are recalled, and thus made conscious. (4) To attain the reality of what is lacking, what is behind the quest expressed by such forms of art, of course takes more than art, it takes political determination and political action on a wider scale. 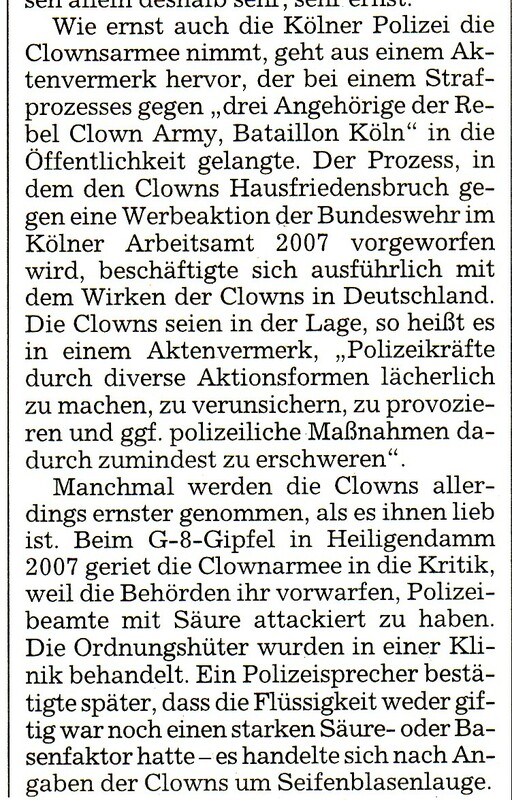 Regrettably, the police department in Cologne was not amused, as the Suddeutsche Zeitung noted. The same negative reaction to subversive street art was typical of the authorities in the state of Mecklenburg Vorpommern where 'clown army' artists targeted the G-8 meeting at Heiligendam. The press has variously noted the enormous deployment of the military and secret service personnel, in addition to thousands of para-military police officers, during this big public relations event, a come-together of George Bush, Putin, Blair, and a few lesser known 'leaders' ostensibly meeting to discuss pressing problems of the world, albeit without any conclusive result. During the meeting, the tents of hundreds of anti-globalization protesters were subjected to military surveillance by German jet fighters equipped with cameras. The fighters flew over the camp(s) of the protesters at an altitude which some describe as possibly the minimum altitude technically possible for attacking jet fighters. They terrified the camping youth, they exposed them to enormous noise, to hazardous exhausts, and to the imminent danger of a terrible accident. The German army command and the government was apparently opting for massive intimidation. In contrast to this show of force, the young happening artists from the region, truly inspired by the 'clown army' idea and joined by colleagues from other areas, chose an aesthetic strategy of ridicule that mimicked, again and again, in ever new artistic ways, the martial behavior of the heavily armed 'forces of order.' Their artistic concept was a fantastic way of expressing different values, those of civil disobedience, of pacifism, of peaceful protest. They produced laughter and a sense of aesthetic relief. They certainly helped defuse a situation where otherwise anger might have been vented by some protesters. And they exposed the needlessly militarist show of force of the Merkel administration as folly. In other words, their street art accomplished what all great art accomplishes - it heightened awareness and it produced comic relief; it sharpened the consciousness of many in the audience (both among the protesters and the police), and it fascinated due to the aesthetic imagination at work. However, once again, the forces of order were not amused. In one instance, a clown had used soap bubbles, blowing them into the face of a police office. As the paper reported, an officer was "treated in hospital" because he was "attacked with acid" (mit Saure attackiert). (2) Apparently, the press release was part of a campaign of disinformation of the government, intended to influence public opinion. Interestingly, the police was later on forced to take back that assertion. The inspiring memory of what street art is capable of remains. The 'clown army' idea and those who have grasped its potential have produced a motivating example, and they have expanded once more the frontiers of art, just as the Bread and Puppet Theater did several decades ago. (1) This was entirely in the vein of Surrealist predecessors. Hadn't Louis Aragon pointed out that "[a]rtistic skill is mummery that compromises all of human dignity"? See: Maurice NADEAU, The History of Surrealism, New York (Collier Books) 1967, p. 85 - And hadn't André Breton, in 1926, written that the surrealists "use [the] pen [...] without the slightest professional arrogance [...]" (Ibid., p. 245)? (2) This tendency to prefer anonymity to stardom and 'collective' or 'group' creativity to individual 'performances' is remarkable. As Maurice Nadeau notes with regard to the United States, they have "an important tradition of cranky eccentricity in the arts" that deserves to be called non-conformist, that is to say, not toeing the line of the dominant 'bourgeois' morality (or ideology). "But," Maurice Nadeau adds with regret, "with the exception of Gertrude Stein, the recluse strain was very strong in all of them; their hopes and hoaxes remained very individual affairs." (Ibid, p.31) - Isn't it a challenging idea that we could indeed place the 'Clown army' artists among the heirs of Gertrude Stein? And this even though her crankiness and her hoaxes were of a sort rather different from the strange ways and hoaxes of today's street artists? (3) A "Clown Army" artist, quoted by Titus Arnu. 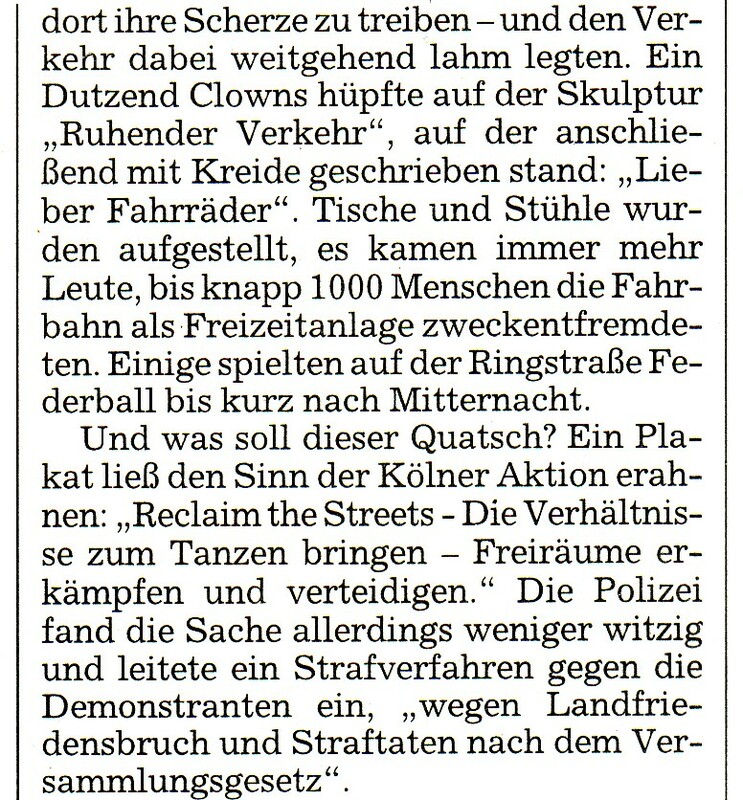 See Titus ARNU, "Politik mit Pappnase", in Suddeutsche Zeitung, May 10-12, 2008, p.12. (4) Hans H.Hofstatter described symbolic art as integrating "significant evidence[s] of contradiction" ("bedeutende Zeugnisse des Widerspruchs"), containing "elements ... which, resisting all attempts of repression," have accompanied Western (Christian) culture for centuries. As its other side, so to speak (the "Nachtseite" or aspect of night; the negation). And this, in modern times, from Hogarth (17th century) and Piranesi to the present. See Hans H. HOFSTATTER, Idealismus und Symbolismus, Vienna / Munich (Anton Schroll & Co.) 1972, p.5 - In fact, the symbolic street art of the new happening artists follows in exactly that vein, representing the other side (the negation) of official political culture and the art that kowtows to it. This art form expresses contradiction, it resists repression, it creates awareness of the repressive barriers of bourgeois politics and bourgeois moralism. It pokes fun at the contemporary despotism of the global economy and its major players and political clerks. This photo is reproduced here for scientific and historical purposes of documentation. Please note the mock weapon, mock uniform and mock-serious face of a street artist mocking an armed "force of order"
(or should we say, disorder?) which is again and again confronting artists and peaceful protesters. police officers. They resemble army uniforms. The paramiliary police is comparable to the National Guard, perhaps.